Do they make these? For SRAM or Shimano brakes if not using a matchmaker, I always position it lever>shifter>grip. But with the SRAM shifters (XX1) they stick out too far into the grip but the levers are in the right position. Switching it the other way will make the lever too close for one finger braking. Any one using a similar setup? I'm more confused by the clamp on your shifter. My SRAM shifters with removable clamps (10 speed X9, 11 speed GX) are much skinnier and have one bolt that goes into the shifter pod. And the shifter pod has two spots where that bolt can go in, left or right. Choosing which of the two holes allows side-to-side placement options. It looks like of like that bolt hole I'm talking about is in your picture to the right of the clamp, under the black metal ring of the grip. Are these the older style clamps that wrap around the shifter/brakes like a clamshell? With the newer style clamp, you'd probably be able to position things the way you want. Maybe I'm getting mixed up between Matchmaker and Matchmaker X. In which case, upgrade your shifter. https://www.sram.com/sram/mountain/products/xx1-x-actuation-trigger-shifter Seems to show the type that I'm familiar with. I always position the right side shifter>Lever>grip. I don’t like the shifter protruding into my grip area, and I still maintain the large lever>grip spacing for one finger braking. Me too. I've actually gotten blisters on my hand from rubbing against the shifter because it was too close. I have pretty big hands and long fingers so I can have a good space between the grip and shifter, with the brake in the middle. As for a matchmaker, I'm not sure if they make them for hope plus sram or Shimano. If anyone did it would probably be problem solvers or hope. Problem solvers does not work with hope, only shimano/SRAM mismatch. it looks like hope makes some brackets for a single clamp setup. Team Shifter > Brake > Grip. I'll give this a try, though I'm the opposite of Jeremy and Maciej, as I have thick palms and short fingers, like a chimp. I believe the clamps were from an XO brakeset this was matched to, therefore one clamp for both. Your pictured shifter mount is the current SRAM Matchmaker mount - I just got one for my dropper lever. 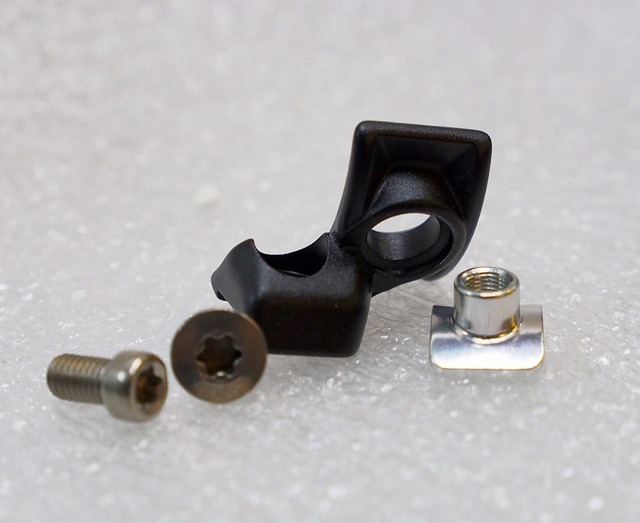 It is essentially a SRAM brake lever clamp with the little offset threaded mount. You can see that your "mount" extends to the "right", and this is what I used on my left side to move the dropper lever inboard and away from my grip. If you get the matchmaker mount that extends to the "left", you may be able to move your lever 10-20mm inboard, and avoid moving the clamp "inside" your brake lever. so - just was messing with this today - the hope "adapter" says rh, but it inboards the shifter too much. i'm going to put the lh one on and see how that does. i can't reach the upshift trigger. You can mount the shifter in the second hole to move it in more. Just move that little 3mm(?) screw. i think switching to the lh adapter, and switching holes should do it.